Cuban artist Carmen Herrera has led a very cosmopolitan life. Born in Havana in 1915 she has lived in France, Cuba and the USA, moving frequently throughout the 1930s and 1940s before finally settling in New York in 1954. Despite the visionary nature of her work and her association with artists of great reputation and influence, including Barnett Newman and Leon Polk Smith, Herrera's paintings have been the subject of few exhibitions. This is a story familiar to many women artists of her generation emerging during the post-war years. Redressing this, Herrera's exhibition at Ikon is her first solo show in Europe and her most comprehensive to date, including paintings and works on paper from the late 1940s through to the present day. At the heart of Herrera's work is a striking formal simplicity and attention to colour. Devoid of any referential aspects, her paintings combine line, form and space to convey an intense physicality. Returning to Cuba from Paris around 1935, Herrera studied architecture. Paintings such as Blanco y Verde (1959) reveal the influence of this discipline whereby predominantly white surfaces dissolve into the gallery environment. The physical limits of the canvas are thus extended to leave a coloured shape floating in space. 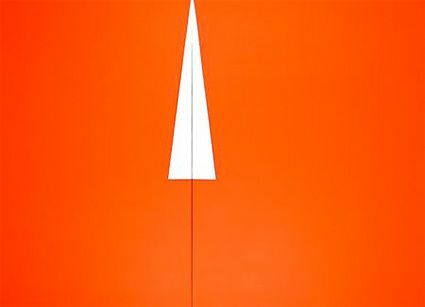 Works such as Black and White (1952) and Green and Orange (1958) have a precision and optical rhythm achieved through the most economic of means. Their direct geometric structure and the austerity of her palette anticipate the optical and hard-edge minimalism of the 1960s. The journey of Herrera's lifelong dedication to abstraction can be traced from a kind of romanticism that informed her work of the 1940s, through to a shift made in 1950. Subsequently she has consistently refined her focus on space and colour, paint characteristically applied in fat, solid areas. Works are organised based on the harmony and tension of opposing chromatic planes, combining symmetry and asymmetry as a means to give structure to the surface. Reducing her work to the play between two colours, Herrera creates an experience of sophisticated intensity.